I stand on a brink, like the rest of the world. The age that I am now is very special, because it has changed me profoundly. Our brain structure is said to undergo a transformation, for the last time, around our early twenties, causing the brain to rewire itself and cause us to think and act more functionally and efficiently, so as to prepare us for adulthood. I think this may have happened to me, because in a lot of ways, I feel a little steadier than I used to. But in other ways, the future seems less certain than ever before, and I feel as though I have spent most of my education preparing for a different kind of world. The word I’ve encountered in various outlets when reading about the Fourth Industrial Revolution has been: disruption. Or, the disruptive power of technology to fundamentally transform the way we live and work – to change the rules of a systematized, long-running game. Various estimates have ensued. For instance, a prediction that has been making many headlines is that almost half of all jobs will be automated in the next twenty years. This will inevitably transform our economies – in fact, it has already been shown to have an impact on jobs and income distribution, as intelligent machines have begun to utilize their machine learning capacities to automate increasingly skilled and sophisticated operations. Some of the fields where emerging technological breakthroughs have been prominent, as declared by the World Economic Forum, include “artificial intelligence, robotics, the Internet of Things, autonomous vehicles, 3-D printing, nanotechnology, biotechnology, materials science, energy storage, and quantum computing.” Because the speed of these breakthroughs will double at an exponential rate, the tasks in each respective field will most likely require increasingly specialized labor. As for what their breakthroughs themselves will mean for humanity, one can only imagine how far-reaching their influence might be. There is a fundamentally modern idea that seems suitable for this time, that instructs us to always embrace new ideas as they come into our lives, and maintain a childlike state of wonder. But as we grow older, we are naturally more resistant to change, because we have a lifetime of experience as the source of proven evidence that the world functions a certain way. I think this is why for a lot of us the idea of intelligent robots is a little bit uncomfortable – it brings up the idea that we are getting older, and maybe a little less open to accepting new, outrageous information and imagining society in a way that is completely foreign to us, because we have already formed steady, firm values and beliefs. And yet, at the same time, reading about the limitless power of technology makes me feel like a child again, in the best way. We are on the brink of a revolution. Change is in the air. We all have a role to play. The possibilities are endless. Our wildest ideas could become a reality. Isn’t that a good time to be alive? I am especially excited to witness how the sociological side of this revolution will unfold. 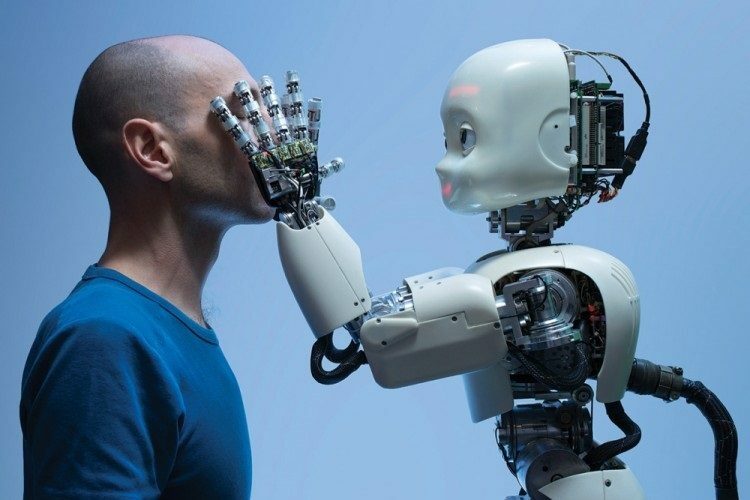 What could the role of robots be, beyond increasing productivity and changing the workforce? They could prove to be the instigators of real, irrevocable social change, forcing us to engage in critical thought and reflection on the beliefs that serve as the foundation for everything we know and trust. I wonder how technology might alter the ways we live and work, and ultimately, perceive ourselves. The psychological, social and governmental impacts will likely be as profound as their technological counterparts. We have, for a long time, scoffed at the idea that a robot could do a job exactly as a human being could. If, and when, this is no longer the case, it will be interesting to see how we will respond to being outperformed, or when the notion that our humanity is irrefutably special is challenged. Governments will also have to be prepared to (proactively) respond with adequate policies aimed to make the transition as smooth as possible – experimenting with universal income, for example, is one way that might change how we think about the purpose of work, leisure, governance, relationships, time, and what truly matters in our lives. There are obviously dangerous implications and possible consequences to this process: in the case of AI, for instance – how would we maintain and control that whose intelligence exceeds the bounds of our own, if we can barely imagine its capacity and potential? How could we prevent technology leading to greater worldwide inequalities? What parts of our humanity might be lost, if technological breakthroughs become wholly integrated in everyday life? Will it ultimately be worth it? I suppose there is no one answer to these qualms, and because of this, the importance of access to information in our current social and political climate cannot be understated. We may not all have the technical skills and knowledge to fully understand how the new world will operate, but we will have to decide to what extent we want it to affect our livelihoods, and we must be prepared to make informed decisions and judgements. We must also develop a readiness to critically examine new ideas, and engage in dialogue within our communities. As political bodies will be forced to make speedy decisions, the public’s demands must also be clear and readily expressed. Because of this alone, my earnest hope is that the Fourth Industrial Revolution will spark a collective evolution, and a raised standard of thinking and behaving, as well as a concern for what is best for the global community, and ultimately lead to the betterment of humanity. Sara Jovanovska, a participant of AskPetersen Scholarship.